The Meg is the blockbuster shark monster movie we didn't realise we needed in our lives. 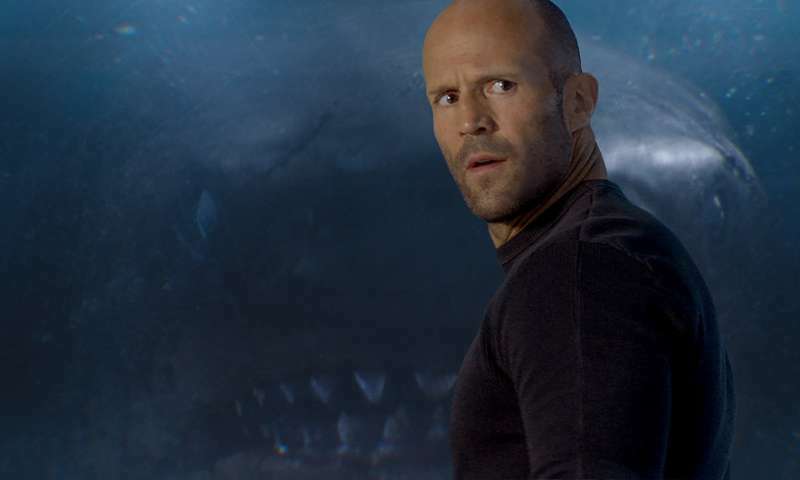 With a cast led by Jason Statham, this is a big-budget version of several megalodon movies that have popped out over the years – including Megalodon (2002) and Jurassic Shark (2012). We're going to focus instead on other scientific issues raised by the movie, featuring a giant shark that is thankfully now extinct (it lived from about 16 million to 2.6 million years ago). First of all, let's get it out of the way that pressure is not force: pressure depends on the area over which the force is applied. So a bite force is applied through the contact points of the teeth; if the contact area is small, the pressure can be quite high, which is why pointed teeth are better at cutting. To give the movie a fair go, we can assume that the glass is overdesigned to the same extent as James Cameron's Deepsea Challenger deep-diving submersible. That craft was tested to an "equivalent full-ocean-depth pressure of 16,500 pounds per square inch or 114,000kPa". That's a contact area of about 4cm x 4cm spread out over all teeth. From the footage, it seems plausible that there would be this much contact area between the teeth and the glass, meaning the pressure would be insufficient to immediately break through. Score one for human technology, zero for nature. We are expected to suspend belief many times throughout the movie, but one scene particularly stretches credulity. The team successfully poisons what they think is the Meg, and haul it onboard using the ship's crane. The problem: the shark they have caught is clearly (at least to us viewers) much smaller than the one they've been fighting with for the rest of the movie. The big bad shark is still out there, and the characters are oblivious. In the character's defence, most of their encounters with the shark have been underwater in panicked situations with few reference objects, making absolute size estimation difficult. Real-world studies of large whale sharks have shown that measuring their dimensions is extremely difficult, and have even involved using lasers. According to the film's production notes, the Meg in the movie can reach speeds of more than 80 knots (150kph), and appears to approach this speed when chasing Jason Statham. The fastest submarines reached reported speeds of more than 75kph. Conventional torpedoes top out at around 110kph, whereas Russia's supercavitating torpedoes could reach 370kph. Given that the shark appears to be a "normal" shark in all respects other than its size, and without access to any special supercavitation capabilities, its slated top speed seems optimistic at best. The Meg in the movie is shown to be really hungry (or just nasty); it appears to eat a lot of people. But how much would it actually need to consume to sustain itself? Either way the chances are very low, but not as low for regular ocean-goers as for a random person plucked from a continent. The Meg movie combines all the typical monster movie cliches with a few nice touches and some terrifically bad dialogue (so bad it's good in parts; it had people in our cinema in stitches). It's also somewhat liberating that the villain in this movie is not a modern shark but a fantastical creature from millions of years ago, allowing us to be a little more indulgent as viewers. Statham is great, as is ten-year-old rising star Sophia Cai. The script writers have stretched plausibility on some of the shark's general physical capabilities with respect to size (a little bit), speed (probably a lot), and appetite, mainly for dramatic effect. But turn down your brain and it's hard to argue with the entertainment value of a big monster spectacle, especially one that features scintillating lines like, "That living fossil ate my friend."